The last few months have been a bit of an interesting ride when it comes to persuading Little Z that pre-school is the best fun ever. There are days when he will love it and will keep asking to go every 3 minutes. And there are days when he will strum my heart strings like an expert harpist, give me the big doe eyes and ask if he can stay with me at home, complete with clingy hugs. There have been days when I’ve felt the motherly guilt dropping off a sad-looking boy and days when he’s ran not looking back and left me to hang his coat up and then shuffle on out wading through the other flow of kids all laughing and crying too depending on their mood. But after many months of this interesting ride I think we have finally cracked it. Whilst I don’t think we will be without some doe eyed days, I know he really enjoys it and is always running around at speed when I go to get him. Football has to be a particular favourite and he adores his own keyworker as well as everyone elses. It is a massive comfort to know that the whole environment is a friendly and nurturing one. Of course this comes about 2 weeks before he breaks up for 7 weeks of long summer holidays but I’m hoping that the settling back in phase in September won’t be too painful. 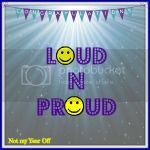 Do you have a loud and proud moment you’d like to share this week? Grab the badge and come link up all your new or old special moments whether they’re big or small. The linky will stay open until Sunday night! So glad he’s finally cracked it! You will probably find he really thrives next year in his final year, it really seems to boost their confidence. I think it does take them a long while to settle in. Sounds as though he’s getting there. I also think that although they do enjoy it, they will always miss their mummies. Sorry I’ve got no #loudnproud post for this week. We’ve been so busy and I’ve got to save one up for next week! Aww glad that he has cracked it..it isn’t easy! I am dreading Bee starting nursery!